"I feel like we're in that turning point right now," Kamasi Washington says. Growing up in Los Angeles, Washington was known in school for playing renditions of Boyz II Men and Jodeci songs on his clarinet. Now, he's mentioned in the same breathe as rapper Kendrick Lamar — Washington's saxophone skills can be heard on Lamar's 2015 album To Pimp A Butterfly — as major players in a larger celebration of black culture. "I feel like we're in that turning point right now," Washington says. "It's been a long time coming. It's weird, it's like culturally we've been appreciated in a certain sense, but not necessarily celebrated. And now we're going to celebrate the culture." For Heaven and Earth, Washington tapped into creative escapes in the form of the video game Street Fighter and movie Fist of Fury, both of which found their way into song titles ("Fists of Fury," "Street Fighter Mas") on the album. Washington tells NPR's David Greene about the movie's influence and explains the deeper sentiments expressed in his music. Read the edited interview highlights below and listen to their full conversation at the audio link. On the meaning of "Fists of Fury"
At a certain point, when there's a barrier between you and what's right, eventually you have to decide you're not going to allow yourself to be subjugated. For me, that song is that decision and recognition of the fact that I see what's happening in the world, and I'm no longer going to wait for someone else to fix these things that are happening in the world. I'm going to do it myself. Harmony of Difference to me was an opportunity to celebrate one another. And "Fists of Fury" is an opportunity for us to protect one another. If you look up, and you see that all of a sudden the world is really coming down on people with brown hair, I would think the people with black hair would look at that and go, "Well, that could be me and so, I shouldn't stand for that any more than those people with brown hair stand for it." Harmony of Difference is about appreciating the fact we have people with brown hair, black hair, blonde hair, green, blue. This precious thing of empathy and love and understanding is something we have to hold and appreciate and protect. That's why I was saying Harmony of Difference and "Fists of Fury," they're together. It's like, "I understand, and I see who you are, and I love who you are, and I love what you are even though it's not what I am. I'm also going to protect you, and you're going to protect me. We're going to work to make the world what we want it to be." 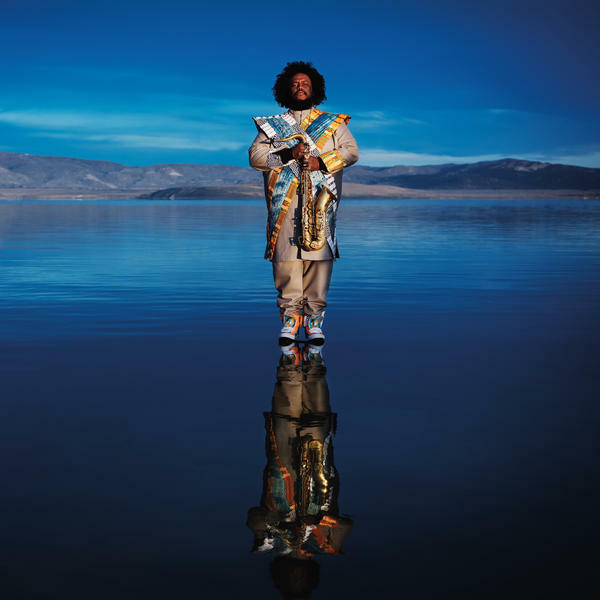 Kamasi Washington has been called the new jazz torchbearer by Rolling Stone magazine. He has also drawn comparisons to John Coltrane. But growing up in Los Angeles in the '80s and '90s, he was known for something else. GREENE: Boyz II Men on clarinet? WASHINGTON: Everybody - I was, like, the star because I could do that. GREENE: Well, now Washington plays the saxophone more. And you could hear him on Kendrick Lamar's groundbreaking 2015 album "To Pimp A Butterfly." KENDRICK LAMAR: (Singing) Loving you is complicated. Loving you is complicated. Loving you is complicated. Loving you is complicated. GREENE: The exposure from that album helped launch Kamasi Washington's career, and he's out with a new album now. It's called "Heaven And Earth." Some are actually mentioning Kamasi Washington in the same breath as artists like Kendrick Lamar, also writers like Ta-Nehisi Coates, all of them playing a central role in a larger celebration of black culture. And Kamasi Washington says he is sensing a moment. WASHINGTON: I feel like we're in that turning point right now. I mean, it's been a long time coming. It's weird. It's like, culturally, we've been appreciated in a certain sense but not necessarily celebrated. And now I feel like we're going to celebrate the culture. GREENE: The first track on his new album is called "Fists Of Fury." It's a confrontational song that takes its title from a Bruce Lee movie. WASHINGTON: (Singing) And when I'm faced with unjust injury, then I change my hand to fists of fury. GREENE: In some of the early reviews of this song, people have said they're sensing a call to action from you. I mean, this - it's a powerful song. Is it a call to action? Are you telling us all to do something? WASHINGTON: I'm telling us all to stop not doing anything. WASHINGTON: I don't know if that's, like, a double negative or something like that (laughter). GREENE: No, I got it. I get what you mean. WASHINGTON: I mean, at a certain point, when there's a barrier between you and what's right, eventually you have to decide that you're not going to allow yourself to be subjugated, you know? And so for me, that song is that decision and that recognition of the fact that I see what's happening in the world and I'm no longer going to wait for someone else to fix these things that are happening in the world. I'm going to do it myself. And so we have to kind of make that decision. GREENE: Your last release was "Harmony Of Difference," which really tried to be - seemed like it was pulling people together. I think "Fists Of Fury" - that feels like a change. WASHINGTON: I mean, I don't see it as a change, really. It's kind of like - like, "Harmony Of Difference" to me was an opportunity to celebrate one another. And "Fists Of Fury" is an opportunity for us to protect one another. You know? So if you look up and you see that, all of a sudden, the world is really coming down on people with brown hair (laughter), I would think that the people with black hair would like at that and go, like - well, that could be me, and so I shouldn't stand for that any more than those people with brown hair stand for it. GREENE: It's so interesting because I just listened to you talking about that, and I think of, you know, one of the very controversial moments or periods recently was the whole debate over if black lives matter, can you then say that all lives matter? And there were a lot of people in the Black Lives Matter movement who said that's not the thing you should say right after you say black lives matter because it's important to just say black lives matter, period. But I mean, you seem to be saying that all lives really matter. WASHINGTON: I think Black Lives Matter is saying that all lives matter. So the problem with when you return the saying - oh, all lives matter - is the reason why I'm saying that black lives matter is because it appears that society does not believe that black lives do matter. And so in saying that, what a person is saying is not that - let me see. The reason why people don't respond well to the notion when you say black lives matter and someone says - oh, well, all lives matter - what that is kind of implying is that the reason why you're saying black lives matter is invalid. You know what I mean? It's like, I'm saying black lives matter for a reason. The real issue of Black Lives Matter is that when a black life is taken, there's clear and present evidence that it was taken unjustifiably. And society says that that wasn't a crime. I do believe that life is precious, and all life is precious. But I do also understand the difference between the intention of when you say black lives matter and the intention of when someone says all lives matter. So I would ask the person that says all lives matter - what is your intention in saying that? GREENE: Kamasi Washington's intention seems to be to stay hopeful. This music on the new album has the feel of trying to lift us all up together. In the last track, "Will You Sing", his choir says - with our song, one day we will change the world. WASHINGTON: (Singing) With our song, one day we'll change the world. GREENE: I'm hearing from you something really beautiful. It's like a focus on empathy. GREENE: It kind of just feels like on all sides, empathy is something that is really missing in society today (laughter). I think you can look around and really feel it. WASHINGTON: It's one of the most important things, and it is missing very much. And I feel like - we have to register that and understand that this precious thing of empathy and love and understanding is something that we have to kind of hold and appreciate and protect. And that's why I was saying, like, that "Harmony Of Difference" and something like "Fists Of Fury" - they're together. You know? It's like, I understand. And I see who you are, and I love who you are. And I love what you are, even though it's not what I am. And I'm also going to protect you, and you're going to protect me. And we're going to, you know, work to make the world what we want it to be. GREENE: Kamasi, it's really a pleasure talking to you. WASHINGTON: Yeah, you too. You, too. GREENE: Kamasi Washington - his new record is called "Heaven And Earth." (SOUNDBITE OF KAMASI WASHINGTON SONG, "WILL YOU SING") Transcript provided by NPR, Copyright NPR.